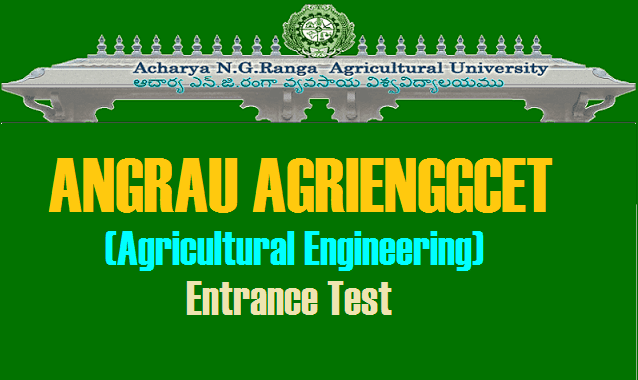 AGRIENGGCET 2018| Acharya N.G.Ranga Agricultural University Agricultural Engineering Entrance Test Notification 2018| ANGRAU.AC.IN AGRIENGGCET 2018| Acharya N.G.Ranga Agricultural University Agricultural Engineering Entrance Test 2018| ANGRAU.AC.IN ,ANGRAU AGRIENGGCET 2018 Agricultural Engineering Entrance Test 2018 Notification, ANGRAU,AGRIENGGCET 2018/Agricultural Engineering Common Entrance Test 2018 Notification, B.Tech Agricultural Engineering Degree Course Admissions 2018. ANGRAU/Acharya N.G. 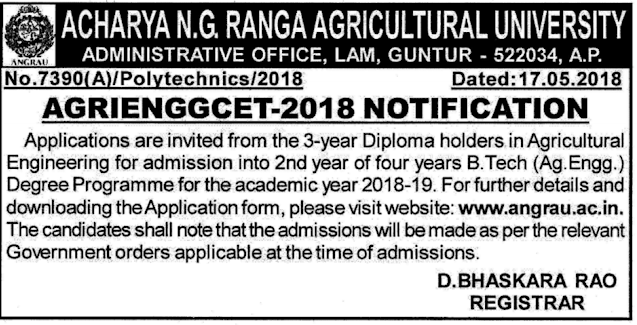 Ranga Agricultural University, Andhra Pradesh state has released AGRIENGGCET 2018 notification AGRIENGGCET - 2018 NOTIFICATION, The applications are invited from 3 year Diploma holders in Agricultural Engineering for admission into 2nd year of 4 years B.Tech(Ag.Engg.) Degree Programme for the academic year 2018-19. For further details and downloading the Application form please visit our website : www.angrau.ac.in. The candidates shall note that the admissions will be made as per the relevant Government orders applicable at the time of admissions. 1. A pass in 3year Agricultural Engineering Diploma Course recognised by ANGRAU. 2. Age Limit:The candidates shall be required to have completed 18 years of age as on 31st December of the year of admission with an upper age limit of 23 years for all the candidates and 26 years in respect of S.C, S.T and 28 years in respect of PH candidates. Admissions will be made strictly as per rule of reservation based on merit through the entrance test in English language degree in AGRIENGGCET-2018 will consist of only multiple choice objective type questions and the candidates shall have to answer in the answer sheet that test will be conducted at College of Agricultural Engineering Bapatla on 17-06-2018 Sunday from 10 A.M. to 11-30 A.M. Admissions will be made strictly as per the rule of reservation based on merit through the Entrance Test in English. The AGRIENGGCET 2018 will consist of only 150 (One Hundred and Fifty only) Multiple Choice Objective Type Questions and the candidates shall have to answer in answer sheet. The Test will be conducted at College of Agricultural Engineering, Bapatla on 26.06.2018 (Saturday) from 10.00 AM to 12.00 Noon. 5. Two Self addressed envelopes with Rs. 5/- postal stamps (For sending Hall Ticket and Rank Card). Interested candidates may apply for admission in prescribed proforma along with a demand draught for Rs. 500/- for general candidates and Rs. 250/- in case of SC/ST/PC candidates drawn in favor of Controller ANGRAU at Guntur. The candidates in person can submit the application form from 07-06-2018 to 14-06-2018 with late fee of Rs. 1000/- for general candidates and Rs. 500/- for SC/ST and PC candidates in the form of demand draught drawn in favor of controller ANGRAU payable at Guntur. Upon submission of application form to convener along with all and closes and with a late fee hall ticket will be issued on the spot. No hall tickets will be issued after 14-06-2018. List of eligible candidates along with the hall ticket numbers will be displayed in the university website on 15-06-2018 those candidates who have not received the hall ticket can, however, download the hall ticket from the university website and attend the test. Applications received after the last date will be not accepted University will not be responsible for any postal delays.